I’ve just received ZOPO ZP900S smartphone from Pandawill by Fedex. This phablet features a 5.3″ display, MediaTek MTK6577 dual core cortex A9 processor with 512 MB RAM, 4GB flash and runs Android 4.0 (upgradable to Android 4.1 once the firmware is released). This is the lite version of ZOPO ZP900 which comes with 1GB RAM. Both devices look like low cost versions of the Samsung Galaxy Note as you can see from the comparison table below between ZOPO ZP900S, ZOPO ZP900 and Samsung Galaxy Note N7000. 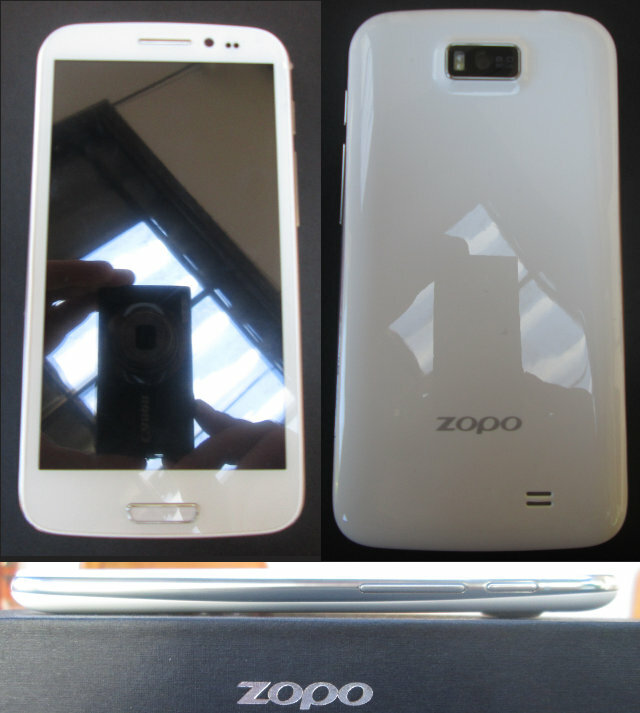 This side-by-side comparison shows the products are similar, and even though the Galaxy Note has better specs (1280×800 screen, faster processor, MHL support, LTE network…), the ZOPO smartphones can be an option for people who looks for an Android phone with a large screen on a limited budget, as they are 50% cheaper than the Samsung Galaxy Note. Pandawill currently has a 8% discount coupon (MAYA2012 – $193.19) the ZOPO ZP900S and a 6% discount (OPPAGO – $216.19) for the ZOPO ZP900 valid until the 7th of December. Time to have a look at the ZOPO ZP900S in details. 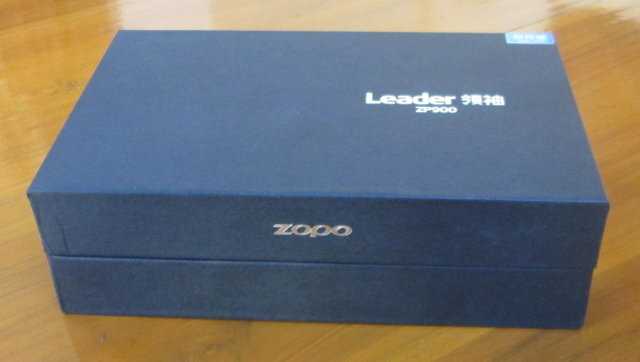 This is the package containing the smartphone and the same as Zopo ZP900. The package contains Zopo Z900S, a 5V/1A power adapter, a plug adapter, a USB to microUSB cable, a 2300mAh battery, headphones, a screen protector, English & Chinese user manuals and what looks like a warranty card in Chinese. Here’s a link to an unboxing video of the ZOPO ZP900. The user manuals are basically worthless, unless this is your first Android device, as they just explain how to use Android. There is nothing explaining how to open the case to insert the battery, inserting the SIM card or microSD card. But it’s not too challenging to do anyway. The screen is not really protected in the package and a close up on the phone shows it has some minor scratches, but hardly noticeable. The phone comes with a standard Android UI, and the very first thing I noticed was the default language was set to Thai language. Pandawill explained me they set the language depending on the customer’s location or his/her requested language. The default keyboard was set to a Chinese/English keyboard. Since I’m still struggling with written Thai and I prefer the Android keyboard, I had to go the Settings to change the language to English and the keyboard. The “About Phone” section indicates the model is ZP900S and it runs Android 4.0.4 with kernel 3.0.13. I installed Antutu, Quadrant, YouTube, Facebook, Skype, Firefox for Android, Subway Surfers and a few other applications from the Play Store App without issues. There was one or two applications that I could not find including Spotify, so I installed XiiaLive instead. I used the phone a few hours, and found it to operate very smoothly, although there were some slowdown at times. Web browsing (Firefox and Opera Mobile) is pretty fast, YouTube plays HD videos just fine, and games are smooth. I used Skype to test the 2MP front camera, and videoconferencing via Skype does work OK, although it’s quite pixelated. The speaker is relatively loud, but you have to be careful where you put your finger on the back of the phone, as it can be attenuated or even muted if your put your finger on top. At first, battery life time seems pretty good, as I used the phone for about 2 hours from a full battery charge, browsing the web, watching Youtube videos and playing games, and battery level was about 75%. Wi-Fi and GPS on, but no network since I did not insert a SIM card. But somehow, the internet radio app started automatically in the morning, and audio must have played around 3 hours, and the battery was depleted. 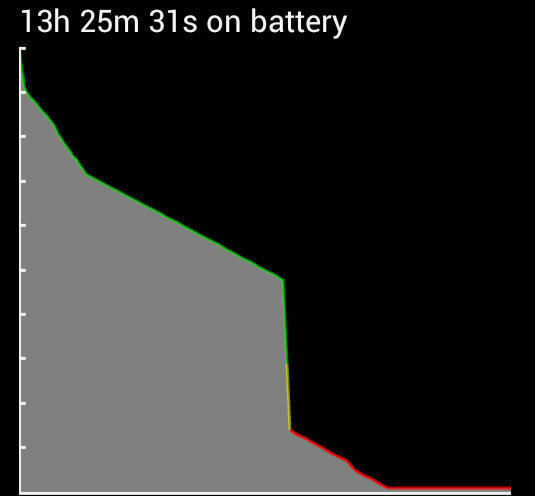 The battery chart looks very strange with a sudden vertical drop, so battery level reporting may not be very reliable. I ran both Antutu & Quadrant benchmarks on the device, which shows performance similar to OMAP4460 / Tegra 2 devices such as Samsung Galaxy Nexus or LG Optimus 2X, but about 30% slower than the Galaxy Note with Exynos 4 dual @ 1.4 GHz. Zopo ZP900S scores 6222 in Antutu 3.0.2, and 2671 in Quadrant. Antutu also shows the product and board name is H958, which may help identify other products with the same hardware, e.g. Hero 9500. A few more things, before I conclude. The device does not come rooted, but instructions are available (I haven’t tried) which also include links to stock firmware files. I’ve used this device with the Android SDK for my GStreamer for Android post and the developer options are easily accessible in the Settings menu. There seems to be a lot of activities around devices based on MTK6577 in XDA Forums, and a few posts specific to ZOPO ZP900(S), e.g. http://forum.xda-developers.com/showthread.php?t=1899412. ZOPO ZP900S offers a large 5.3″ screen with performance equivalent to Samsung Galaxy Nexus, which was the top model just over a year ago. Up to now, I could not find critical flaws to the device, and it appears to be a decent low cost alternative to the Galaxy Note for those wanting a smartphone with a large screen, although you may consider spending $20 extra with the ZOPO ZP900 to get an upgrade to 1GB RAM. ZOPO ZP900S smartphone is also available on Dealextreme ($255 inc. shipping), Aliexpress (Starts at $209.99 with free shipping) and directly from ZopoMobile e-Store ($218 including shipping).